Although there are plenty of home-repair tasks that can be handled by the average homeowner, some things should simply be left to the professionals. Attempting a slab leak repair by yourself, for instance, can cause major damage to your plumbing system and leave you in a position worse than when you started. 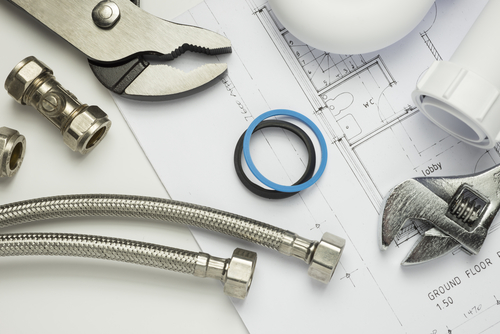 Here’s what can go wrong and why leaving the repair to a professional plumber is recommended. Underneath the concrete floors, water lines carry water throughout your home. When one of these lines starts to leak, it’s known as a “slab leak.” While the out-of-sight nature of these water lines may make you think they are tough to identify, there are several red flags to be aware of. Problems such as a lack of hot water, crack in walls and floors, the sound of running water, a shifting foundation, and moisture under carpeting are all signs that you could be dealing with a slab leak. How Are Slab Leaks Found? One of the reasons why slab leaks require the attention of a professional plumber is that they cannot be accurately identified without specialized equipment. While you may be able to take a guess using the previously listed warning signs, only a plumber will be able to pinpoint the leak’s location and formulate a solution. This is done by using electromagnetic pipeline location devices and electronic amplification equipment. Trying to find the leak without these instruments can cause significant damage that requires costly repairs. How Do Plumbers Repair Slab Leaks? Repiping or Rerouting: If the leak is serious enough, the entire broken line can be replaced. In systems with a history of frequent leaks, this is typically the most effective repair. Epoxy Coating: If there are many small leaks in a system, a plumber may apply a sealing epoxy to cover the problem areas instead of making numerous tiny replacements. Spot Repair: For systems without a history of frequent leaks, simply replacing the specific leaky pipe is usually sufficient. Regardless of the repair method, there’s a good chance you don’t have the proper skills to complete it without error. It’s always best to contact a professional plumber as soon as possible if you suspect a slab leak in your home. A. All Valley Plumbing & Sewer Service provides expert plumbing repairs to all residents of the Cincinnati, OH, area. From tiny leaks to major water line issues, the company’s knowledgeable crew handles a wide variety of issues with efficiency and a customer-first approach. For more information, call (513) 733-3311 or visit the website today.